What's Your Story Reviews: 500 Follower GIVEAWAY! I've finally reached 500 followers, and you have no idea just how happy I am about that. I am so grateful to everyone that has followed my blog and commented on my posts. To show my appreciation, I have a *signed* copy of Forever by Maggie Stiefvater up for grabs! To enter the giveaway, leave a comment below with your EMAIL. I will email the winner on August 6th, and they have 48 hours to respond before I choose another winner. Good luck guys, and thank you so much for your support! Thanks for the chance to win! I'm in the US. thanks for the giveaway and for making it international. Check my site too I'm giving away a signed hardcopy of Passion. congrats on 500! :) how exciting! Thanks for hosting his giveaway for your fellow readers! Count me in please! Yeah for 500! And what a great giveaway! Hey. Thanks for the giveaway. It's a great giveaway. 500 followers, that's amazing. Thanks for the appreciation! Your blog is great! Thank you thank you thank you! I really want this please! Signed Copies are my thing!! I need to complete my signed series of THE WOLVES OF MERCY FALLS! Yay for 500 followers! :) You deserve each and every one and then some! And thank you for the international giveaway!! Thanks for the great giveaway! I would love to read Forever. Congrats to you and what a great giveaway can't wait to read it! Thank you so much for the chance! Comment, Comment, Comment!!!!! OMG!! 500 followers well done, congrats. Thankyou for this chance and offer. Congrat on reaching 500 and hope the 1000 mark arrives soon. Thanks for the great giveaway and please enter me. Congrats to you and your followers. I am follower - gfc Evk. Ooooh! I really want to read this. congrats on your 500 followers!! Ooh, this is nice. :) Congrats on the followers! YAY! :D Congrats my dear! You'll get another 500 in no time! Keep up the awesome work and count me in in the giveway! Congrats on 500 followers! Amazing giveaway too! I just started the series and literally can't put it down! Congrats on your milestone! Here is to 500 more!!! Thanks for the giveaway, I would love to win this!! Yay! This is a great giveaway. Thank you for the opportunity and congrats on your followers! Congrats and thank you so much! I'd love to win this! Congratulations on getting 500 followers, by the way! Congrats!! !Awesome giveaway! I'd love to win this book! Congrats on the well deserved 500 followers! And I really really hope I win this! *crosses fingers* I'm a big Maggie Stiefvater fan and I just love her Wolves of Mercy Falls series! Congrats on reaching 500 followers!! Thanks for the awesome giveaway!!!! Would love to win!!! Congrats on the milestone! Awesome giveaway! I really want to read FOREVER! Congratulations on your successful blog and thanks for the awesome giveaway!! Thanks for the giveaway and congrats on 500 followers! OooH! Congrats, thanks for the fantabulous giveaway I REALLY really want to read this!! Oh I entered earlier void one of them! Sorry! Super congrats on 500 followers! I can't believe you don't have over 1,000 by now, your blog is awesome. 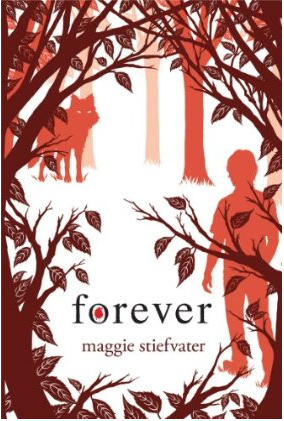 Thank you so much for the giveaway of Forever, I LOVE, LOVE, LOVE The Wolves of Mercy Falls and Maggie Stiefvater. Love Maggie Stiefvater and would absolutely treasure a signed copy of one her books:) Thanks for the great giveaway! I've been wanting to read this forever! ;) Hahahaha ahhh. I crack me up. I really do want to read this though, and the fact that it's signed is awesome. Thanks for this great giveaway! Thank you so very much for this giveaway! I have the first 2 books and would love to read this one. congratulations on 500 followers. This is such an awesome giveaway. Oh thanks for the giveaway want to win!!!! Congratulations on 500. Heres to the next 500! Its good young people read so many miss out.